In the Rainbow Room we learn lots of different things in lots of different ways. We do most of our learning actively; with play, music and creating using our hands and imagination! We work hard to develop skills that will help us to grow and learn. We try to pay attention to our teacher; to concentrate and stay focused on our tasks. We work with others by listening to each other and sharing resources and our ideas. Teamwork is very important in the Rainbow Room. Sometimes we can experience all of these emotions in one day! 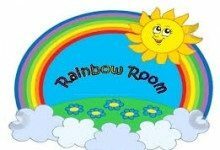 Most of all, we LOVE learning in the Rainbow Room.